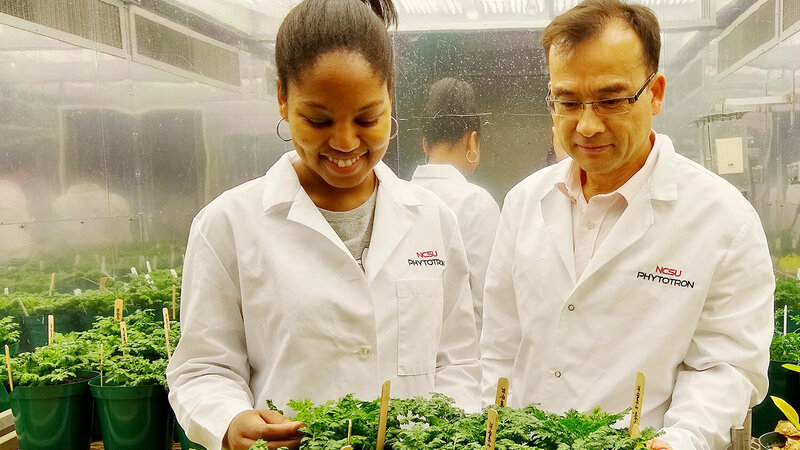 Rika Judd and De-Yu Xie with A. annua plants in NC State's Phytotron. Credit: De-Yu Xie. Now, a new North Carolina State University study shows that this plant-synthesized compound – artemisinin – can be produced more readily in the plant than previously understood, hastening the need to revise current scientific dogma about how and where it is produced in the plant and opening the door for new techniques to provide more stable production practices in the future. At issue is the availability of artemisinin, which is produced by A. annua. The herb grows natively in China and has for thousands of years been used in traditional Chinese medicine remedies. Over the past few decades, artemisinin became popular for its efficacy in treating malaria victims; so-called artemisinin-based combination therapy currently stands as a stalwart solution for malaria sufferers. But the availability of artemisinin has been uneven due to a theory that became ingrained in the scientific literature nearly 25 years ago: the conclusion that artemisinin can only be produced in the glandular trichome (GT) of the herb – that is, in the specialized hairs that grow on the outermost layer of the plant leaf.